EPOXY RESIN 1200 UV ENHANCED 1/2 GAL. 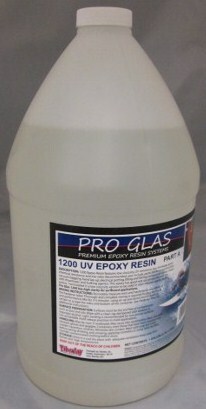 Pro Glas1200 is an extremely clear, tough, high gloss UV epoxy resin. 1200 has been formulated for improved UV resistance to reduce yellowing and surface degradation from UV exposure. 1200 has three hardeners, fast, medium and slow. Not recommended in freezing climates due to possibility of de-lamination.